Itching to climb some Cascade mountain cliffs? Every expert climber starts somewhere, and it’s often the beginner class at the nearest rock gym. On Monday night, I fell off a wall. After a moment I felt the bounce of the harness and stopped. My hands and feet once again came close enough to cling to the rock wall in front of me. “Gotcha,” my partner yelled from below, where he stood with the rope in braking position. The fall had been on purpose, part of an exercise in “Climbing 101,” a class to teach a climber and belayer what to do in the event of a slip. 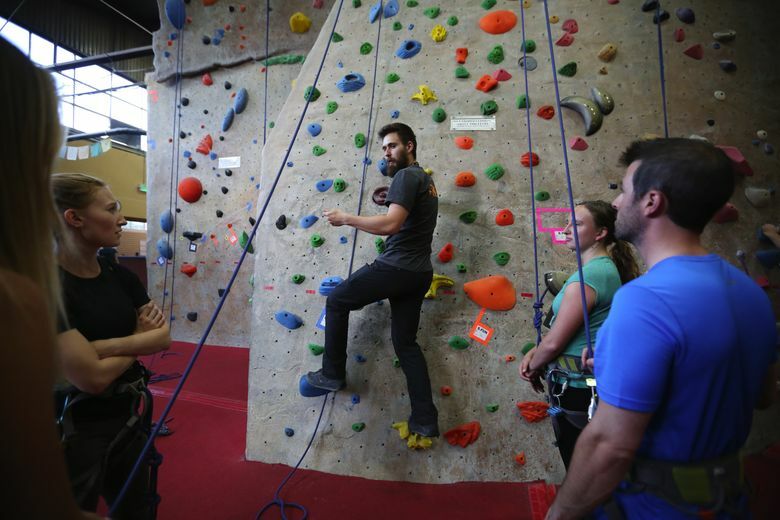 The class, which I took recently at the Ballard location of Stone Gardens climbing gym, is designed to teach anyone the needed skills to safely climb in the gym using what’s called “top rope,” which means the rope has a top anchor in place. By the end of class, students should be comfortable enough with climbing and safety to explore the rock gym on their own. Class members belay, climb and take falls on beginner-level walls. My classmates consisted of two friends looking to get into climbing, and a man who had climbed some beginning levels in college and was looking to get back into it. All three had recently bouldered. I, on the other hand, had never climbed before. By the end we all were tying in, climbing and belaying. The 2½-hour class ramps up and builds on itself, starting with basic equipment and safety. The very first skill you learn is how to tie knots, starting with a figure-eight knot, and then a rewoven figure eight and a barrel knot. Make sure you pay attention here. It’s a task that sounds simple enough but somehow I found myself staring down in confusion and frustration a few too many times at three circles, instead of an eight. The knot tying is done again and again until it’s second nature. The frustration is worth it. You tie all of your own knots before you climb. 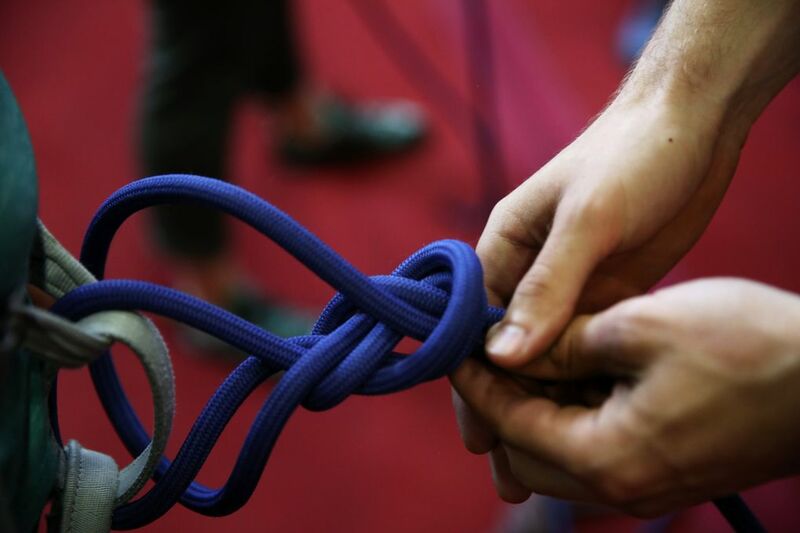 Once you have the knots down you move on to belaying, a series of motions that manage a rope for a climber. The motions, “brake, under, slide” are driven into your head. You will act as a belayer for a climbing classmate. Two friends, Elisa Eminger and Delia Bledsoe, made up the first climber and belayer team in our class. They had some bouldering experience and were looking to get into top-rope climbing. 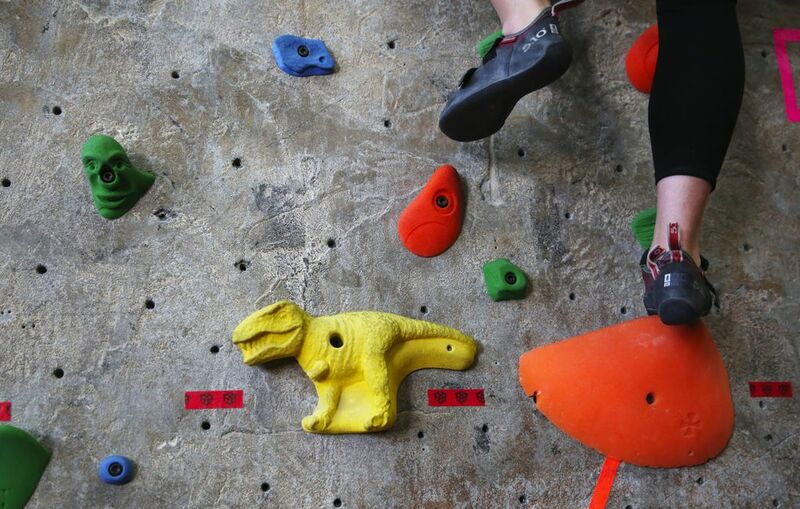 “I want you to reach that yellow turtle,” instructor Donovan Brendler said, pointing three quarters of the way up the wall at a grinning turtle, one of many handles on the beginners’ wall. The two women prepared, starting with safety commands. To begin, the climber says “on belay?” asking if the belay is ready. The belayer replies, “belay on” in confirmation. The climber then will say “climbing,” for permission, and “climb on” from the belayer grants the beginning of a climb. The first easily ascended to the turtle with a triumphant smile, with the help of her belayer and under Brendler’s watchful eye. Another series of commands later, “take,” “got” and “lower,” and the belayer slowly lets rope out to bring the climber back to the safety of the ground. The two friends complimented each other on their technique, both in the climb and the belay. “Good, always compliment your belayer,” Brendler said. The belayer is key to safe climbing. 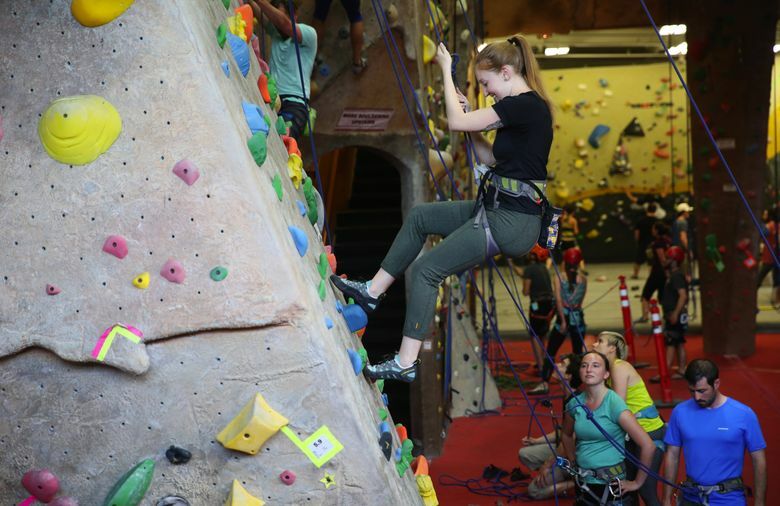 Eminger, who made it to the top of the first wall, said bouldering, which the pair has been doing for a few months at nearby Seattle Bouldering Gym, has helped her get stronger. We moved over to a steeper wall, which I assumed was the new challenge. “Now we’re going to take some falls,” Brendler said. Wait, what? Fall? On purpose? I saw it done before it was my turn, but that didn’t prevent some nervous jitters as I climbed the wall. I kept going up until I couldn’t figure out the next hand hold. My instructor decided this would be a good place for my first fall; I wasn’t so sure. “Just let go completely with your hands,” Brendler urged. “Falling,” I yelled, and let go before I could think too much. We each performed this three times, giving the belayer less warning each time, and then no warning. As someone who never was a big fan of heights I’ll admit this was fun and made the overall climb less scary. “It’s not as intimidating as it may look,” Bledsoe said after class. She encouraged people to just try it if they are interested. Sometimes it may feel as if others are watching you at such gyms but that’s not really the case, Eminger said. “If they are it’s not in a judging way,” she said. The friends said they want to eventually go outdoor climbing, but for now will continue indoor climbing to increase their skills. The class finished with the auto belay, a machine that belays for solo climbers. I found myself suddenly missing the security of the random stranger with whom I had been partnered. About three quarters of the way up I let go, pushing off the wall once on the way down, before landing less than gracefully on the mat below. I’d survived my first-ever climbing lesson. 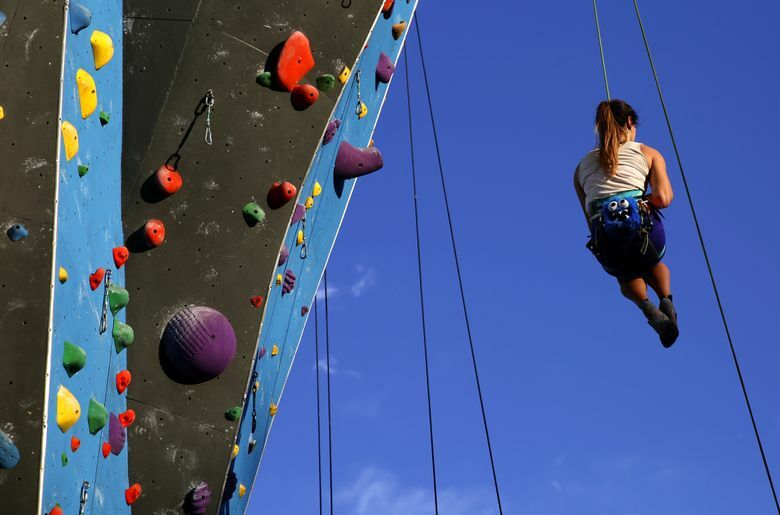 At Stone Gardens locations in Seattle and Bellevue, “Climbing 101” is $55 and offered Mondays, Wednesdays and Fridays from 7 to 9:30 p.m. and weekends from 3:30 to 6 p.m. The cost covers needed equipment and a two-week membership. The class is for ages 14 and older. Show up at least 10 minutes early for orientation and equipment. • Vertical World, Seattle and Redmond: “Intro to Climbing,” $50; verticalworld.com or 206-283-4497 (Seattle), 425-881-8826 (Redmond).